In our home we have two beautiful young ladies. Time does seem to fly and we have slipped from childhood into the teen years. We always remind our girls that the home is the training ground for the woman they are going to be. 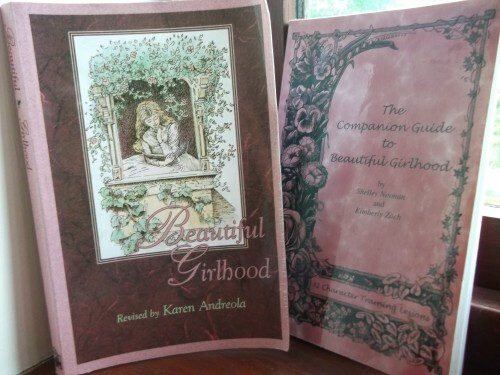 One of the resources that I have found to be such a blessing is Beautiful Girlhood, Revised and Expanded by Karen Andreola. I have worked through this book with our eldest daughter and am now planning to work through it again with our youngest daughter in the near future. 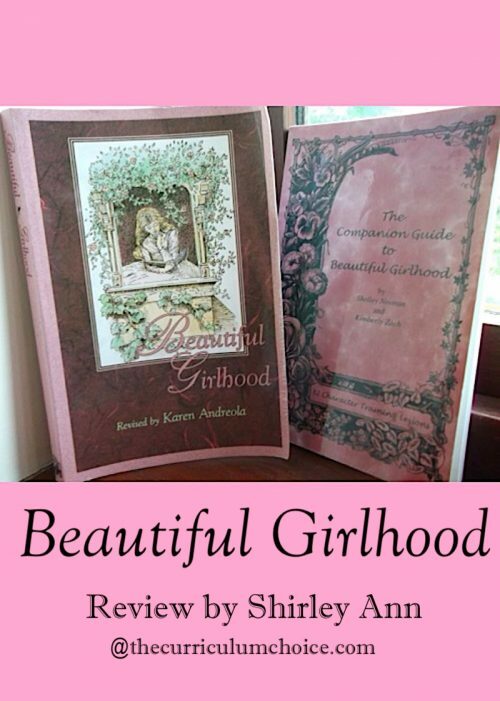 You are also able to purchase The Companion Guide to Beautiful Girlhood by Shelley Nooman and Kimberly Zach. But more on that a bit later. Beautiful Girlhood helps guide your young lady through the years of transition from childhood to womanhood. This book is encouraging and insightful, helping the reader to understand her feelings through adolescence as well as encouraging her to a nobler life and truer ideals. This book covers just about everything that a young lady needs to know or be aware of, from the feelings she encounters at the beginning of adolescence, to purposefully building good character, friends, dreams, modesty, her own personal spiritual life, boy friends, purity, responsibility and choosing a life work – and so much more! There are 33 chapters in this book, each one providing ample food for thought and discussion. If you want to can purchase The Companion Guide’ which has Discussion Questions, Bible Activities and Applications, Journal Topics and a page for your daughter to write her journal response in for each and every chapter. I must point out that the Companion Guide is NOT necessary but certainly is a ‘nice-to-have’. If your daughter loves journaling then it would be a benefit, if not – I would leave it alone so as not to discourage her. The way we have used it in our home was we would set aside an afternoon each week, grab a cup of tea and something yummy and share this special Mother-Daughter time together. Not only does this book speak to the heart of your young lady, but the time you share together is precious and lifelong memories are stored up – strengthening that family bond and strengthening your daughter as she grows into womanhood. May I ask at what age you begin with your daughters? Thank you!